Sun protection, swimming towels, walking shoes, a small bag to carry belongings during tours or nature walks, a warm jacket, a waterproof jacket, cameras, binoculars, food, and beverages. Guests are given a 100% refund if cancellations are made with more than a 2 weeks’ notice. Guests are given a 50% refund if cancellations are made with more than a 1 weeks' notice. There are no refunds if the cancellations are made within five days of the arrival date. A 50% deposit is required at the time of booking, and the remaining 50% balance is collected1 week before arrival. There is no minimum age requirement for children. Gratuity is not included in the base rate, but it is recommended that guests tip the staff at their discretion. Taxes are included in the base rate. Vsits to the Ngare Ndare forest and pool is $20 per adult per day and is not included in the base rate. There are no gift cards or certificates available for purchase. 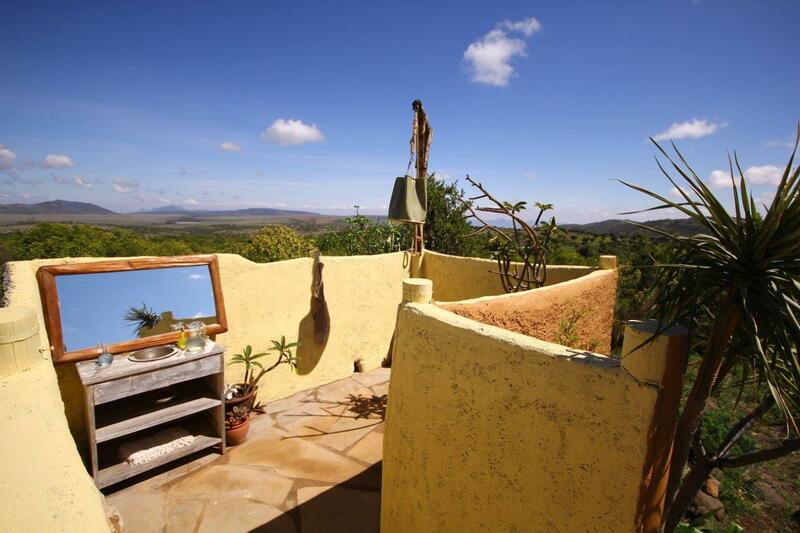 The property is a 3.5 hour drive from Nairobi, and a 30 minute drive from Nanyuki town, near Ngare Ndare Forest. Nanyuki town also has a small airport with daily flights from Nairobi, which take less than one hour. The property is 13.5 kilometers from Timau town. Guests will need a 4x4 if it rains. More specific directions and a map is sent to all guests well in advance. Unlike any other in Kenya, Sieku Glamping has taken all the best bits of the upmarket lodges and combined them with a rustic and authentic glamping element at a good price. The result is a small, bespoke and luxurious self-catering site that recognizes the importance of comfortable living. Rooms are equipped with king beds, feather and cotton bedding, freshly-cut flowers, handmade furniture, oriental carpets, woven rugs, organic soaps, and succulents planted in shells and driftwood from the Indian ocean. Guests with real and wholesome appreciation of the outdoors will love the great views of the Laikipia landscape, big firepits, log fires, picnicing areas with mountain views, day-beds, and hidden-away chilling areas in the bush. The property is located on an evolving farm next to some of the most breath-taking views, forests, wildlife and natural swimming pools in all of Kenya. The unique tent is perfect for couples or families with kids who want extra space, luxurious furniture, and little touches to complete their glamping experience. Inside the tent is a large, king-sized, whitewashed mahogany bed with an extra comfy mattress and feather duvet and pillows, cotton sheets, mahogany side tables with freshly cut flowers from the garden, solar reading lights, handmade wicker clothes shelf and hanging rail, plants, cotton towels, woolen blankets, woven mats, sheepskin rugs, and oriental carpets. Outside the tent is a shade awning with deck chairs and large cushions for lounging. The tent is imported from the UK and features roll-up side walls for hot days as well as a waterproof floor. The tent can be moved to several locations on the property to suit each guest. This tent is perfect for couples who want a cosy and exclusive stay in a tent without others. Inside the tent is a large, king-sized, whitewashed mahogany bed with an extra comfy mattress and feather duvet and pillows, cotton sheets, mahogany side tables with freshly cut flowers from the garden, solar reading lights, handmade wicker clothes shelf and hanging rail, plants, cotton towels, woolen blankets, woven mats, sheepskin rugs, and oriental carpets. Outside the tent is a shade awning with deck chairs and large cushions for lounging. The tent is imported from the UK and features roll-up side walls for hot days as well as a waterproof floor. The tent can be moved to several locations on the property to suit each guest. The largest tent on site, this tent is perfect for couples or families with kids who want extra space, luxurious furniture, and little touches to complete their glamping experience. Inside the tent is a large, king-sized, whitewashed mahogany bed with an extra comfy mattress and feather duvet and pillows, cotton sheets, mahogany side tables with freshly cut flowers from the garden, solar reading lights, handmade wicker clothes shelf and hanging rail, plants, cotton towels, woolen blankets, woven mats, sheepskin rugs, and oriental carpets. Outside the tent is a shade awning with deck chairs and large cushions for lounging. The tent is imported from the UK and features roll-up side walls for hot days as well as a waterproof floor. The tent can be moved to several locations on the property to suit each guest. Sieku Glamping features a Petanque Court (French Boules) for guests to enjoy!